« Cinderella – Awesome Girl! 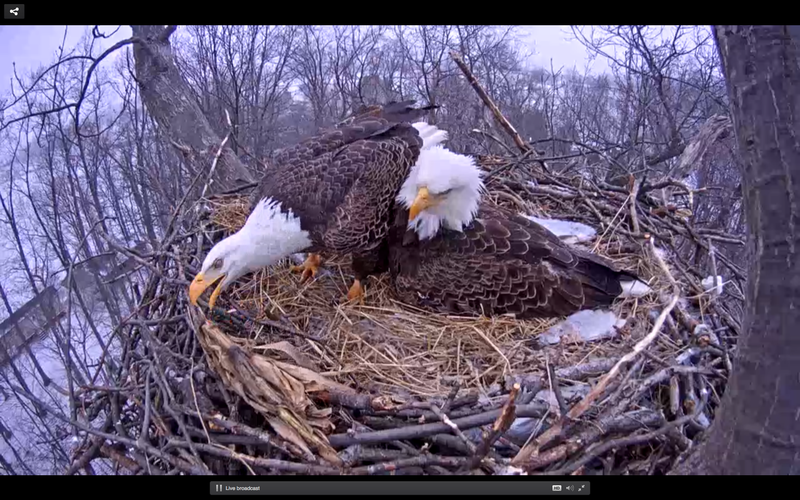 We love to see eagles soar, but I love watching them nest even more. I’ve watched eagle cams, cameras placed by eagles’ nests, before, sometimes with tragic storylines, and am always fascinated. It’s reassuring to watch the parental instincts kick in and know that we share some of those traits with other species. 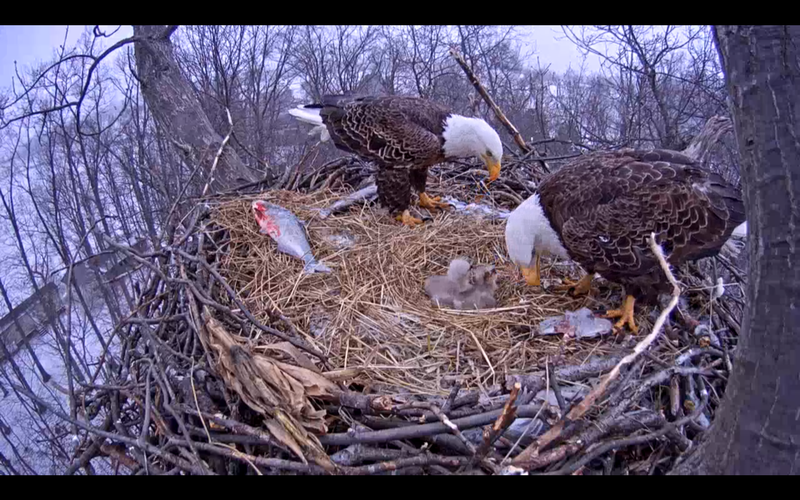 And baby eagles are cute, like all babies. When I was in high school, our team mascot was the Eagle and our publication of student works was titled Eyrie, which is the name for an eagle (or other large bird of prey) nest. So I’ve been watching this Pennsylvania eyrie from the comfort of my home office on my computer or iPad for the past few weeks. It started with the eagle on the nest being covered up to her neck in snow as she sat patiently waiting for her two eggs to hatch. This week they both hatched and today I started my day with the treat of both parents in the nest with the babies. When I first tuned in, the mother (the larger of the two birds) was sitting there, looking around with her eagle eye, and watching snow start to fall again. I’m sure her thoughts (because I’m relating her to my experiences as a mother) are “Snow!!! Again??? Dang!” At one point, she peeked under herself like she was telling the babies to stay still. Later she actually snapped at the snow, catching some for a drink, I suppose. And the wind began to blow her feathers. They’ve fixed the nest up pretty nicely, as I watched them rearrange the grasses before the eggs hatched. And they’ve been stocking up on fish. There’s a wing there, too, so I’m guessing they got a smaller bird. Anyway, there’s plenty of food around. I didn’t have to watch long before the father showed up. 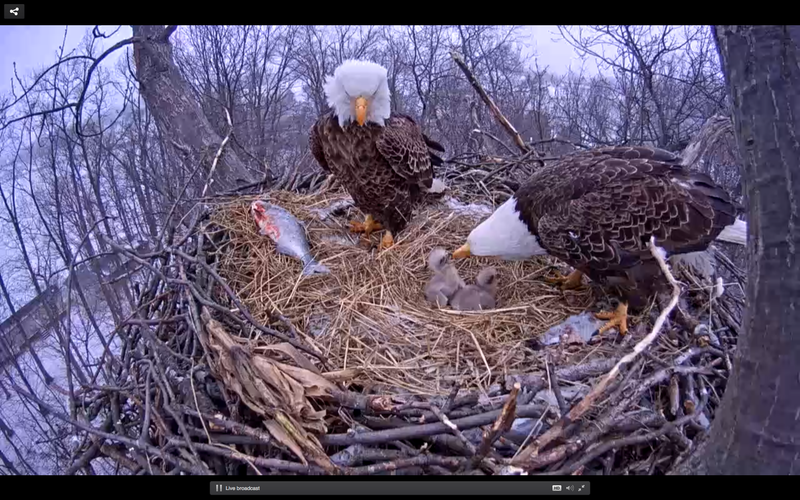 The expression on eagles’ faces is always stern, so it’s hard to tell if the mother was happy or not. I have to go with their body language, I guess. He hung around, looking like he didn’t know what to do and then picked up a stick, a large one. And then he moved it to the other side, getting in the mother’s face to do it. Not hard to interpret what she was thinking here… She got up at that point. 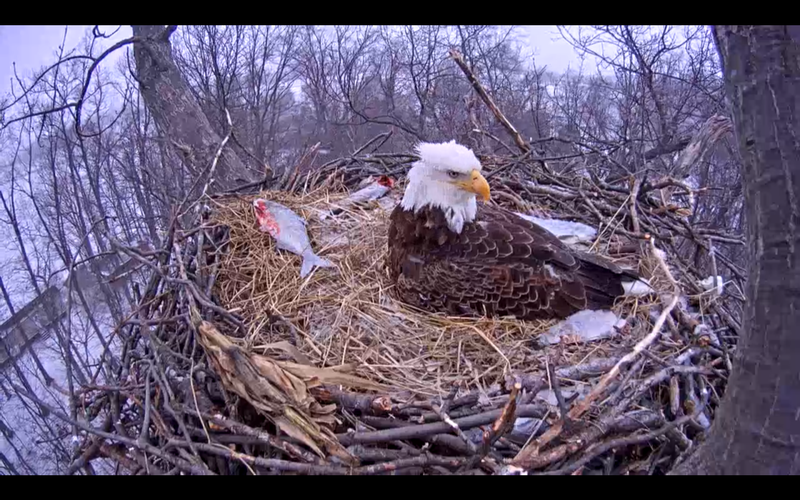 I mean what else is she going to do with wiggly eaglets underneath her and him rearranging her nest right in her face? The eaglets turned to the mother for food, of course. I’m not up on my eagle parenting and I had a husband who helped me with babies, so I’m not sure if this father is the norm, but he stood around looking like he didn’t know what to do while the mother started feeding them. He had picked up the fish and brought them home, to his credit. Big fish! He was walking around, watching the mother feed them when the camera stopped, which it does every once in awhile. I just checked again and he’s gone and the mother is back on the nest. I love to watch her settle down on the babies because she rocks side to side while she gets in position, appearing to be rocking them to sleep. That’s my interpretation, again based on my own motherhood. 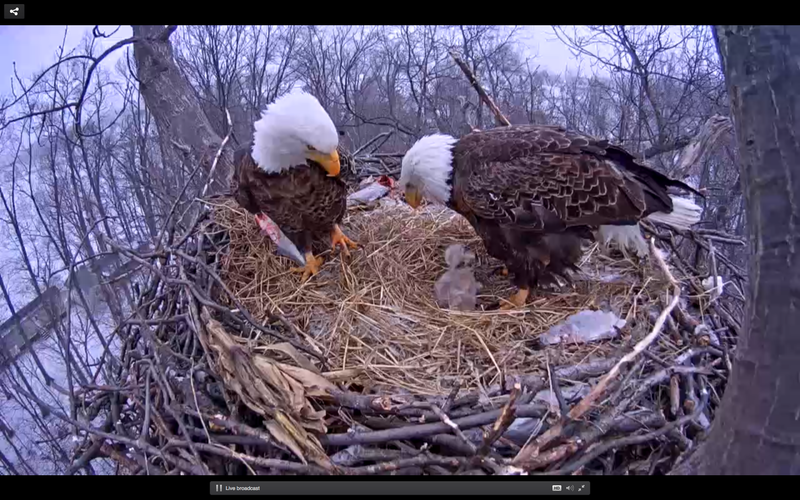 What a unique experience it is to be able to watch a live feed of these mighty birds as they raise their babies. I know it can get seriously sad because there are so many things that can happen to babies before they leave the nest, but it is so very engaging to watch them go through it. The eagles stare towards the camera sometimes and I wonder if they sense they are being watched. Their expression is the same mine would be if I saw a camera there, but that’s always their expression. Please take time to visit the website and watch this family – soon!!! The babies are growing. I guarantee it beats what’s on television most of the time! Really!